Patients with various thyroid disorders generally consult General (Internal) Physicians. 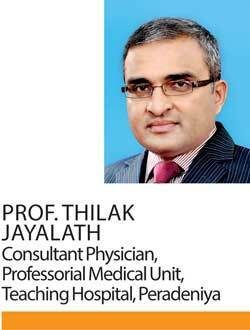 Some of them don’t have classical symptoms and signs of thyroid disease hence strong clinical judgment is needed to arrive at the diagnosis. It’s believed that at least 10% of the population will develop a thyroid condition during their lifetime. More than half of the patients with thyroid disease are unaware of their condition. Women are five to eight times more likely than men to have thyroid problems. The causes of thyroid problems are largely unknown. Undiagnosed thyroid disease may put patients at risk for certain serious conditions, such as cardiovascular diseases, osteoporosis and infertility. Pregnant women with undiagnosed or inadequately treated hypothyroidism have an increased risk of miscarriage, preterm delivery and severe developmental problems, the latter of course during childhood. Most thyroid diseases are lifelong conditions that can be managed with medical attention. The thyroid derives it’s name from the Latin word meaning ‘shield’. 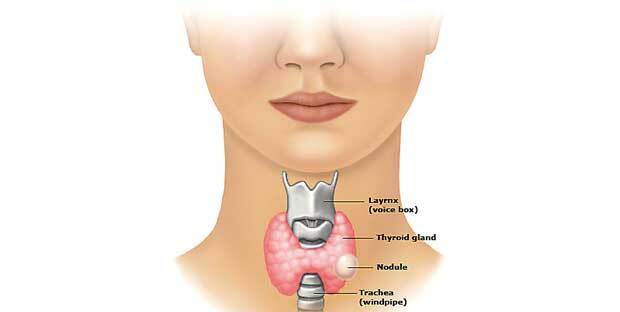 The thyroid is located in the anterior lower neck just in front of the wind pipe (trachea). 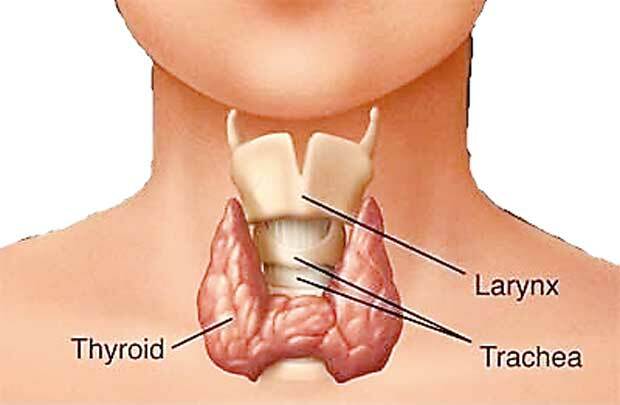 The normal thyroid consists of two lobes placed lateral to the trachea that are connected by tissue called, called the isthmus. L - triiodothyronine (T3) and calcitonin. In humans 80 to 90 percent of the thyroid hormone produced and released is T4 while the remainder is T3. This is the most common test in clinical practice to detect thyroid disease. The pituitary gland produces TSH which circulates to the thyroid gland where it binds onto the thyroid cells to control production and release the thyroid hormones, T4 and T3. These increases in thyroid hormone are sensed by the pituitary and hypothalamus, leading to an acceptable or satisfactory amount of T4/T3. When TSH production drops, lower levels of TSH are detected by the thyroid, leading to release of less T4/T3. The levels of T4 and TSH are inversely related. If the thyroid hormone levels are low, the pituitary pumps out more TSH causing the thyroid to make more T4 leading to higher blood T4 which in turn tells the pituitary to decrease TSH secretion. Similarly, if T4 levels are elevated for any reason, the pituitary responds by shutting off TSH secretion, leading to low or suppressed TSH levels in the blood. In most cases of hypothyroidism with low levels of T4 and T3, very high level of TSH is seen. Similarly, TSH level is very low in hyperthyroidism with elevated T4 and T3. What are functions of thyroid hormones? The thyroid hormones act on nearly every cell in the body. They act to increase the basal metabolic rate, affect protein synthesis, help to regulate long bone growth and maturation of neurons. The thyroid hormones are essential for proper development and differentiation of all cells of the human body. What are the common thyroid disorders? Hypothyroidism is a condition in which the thyroid gland doesn’t produce enough thyroid hormones. Women, especially those older than 60 years, are more likely to develop hypothyroidism. In most cases the thyroid gland is not enlarged. It seldom causes symptoms in the early stages and needs strong clinical judgment to arrive at the diagnosis. There are many causes of hypothyroidism. They include conditions in which antibodies are formed against thyroid, treatment for hyperthyroidism, thyroid surgery, radiation therapy and some medications. The diagnosis of hypothyroidism is made by detecting elevated TSH level and reduced T4 and T 3 levels. In most patients long-term treatment with thyroid hormones is needed as the therapy. Hyperthyroidism is a condition in which the thyroid gland is overactive and produces excessive amounts of thyroid hormone. When the thyroid gland is overactive the body’s processes speed up causing various symptoms and signs. The most common cause of hyperthyroidism is the Graves’s disease in which body makes an antibody that causes the thyroid gland to make too much thyroid hormone. Hyperthyroidism also may be caused by a toxic nodular or multinodular goiter which are nodules in the thyroid gland that cause the thyroid to produce excessive amounts of thyroid hormones. Following are the common symptoms of hyperthyroidism. My mother-in-law aged 83 was suffering from osteoporosis for several years and was under treatment but no cure. She have broken my neck once and back 5 times and also experienced constant pain in her shoulders, back and limbs. A friend introduced me to Best Health Herbal Centre, she told me Best Health Herbal Centre osteoporosis herbal remedy reversed her mother's osteoporosis within 5 weeks, Now she is osteoporosis free. January this year i purchased osteoporosis herbal remedy for my mother-in-law, she only used it for 5 weeks, her osteoporosis was totally reversed. All thanks to Best health Herbal Centre for saving my mother-in-law life.